Five-Seasons Replacement Air Filters improve air quality by removing dust, pollen and other contaminants. The Five Seasons M8-1056 replacement benefits users with a deep filter material that provides increased surface area to collect airborne particles such as lung-damaging dust and pet danger. The FiltersFast Brand Five Seasons M1-1056 MERV11 2 Pack replacement provides relief from sinus irritation that causes watery eyes, itchy throat, coughing, and sneezing by capturing airborne contaminants in a high surface area filter design. The Five Seasons MU1625 replacement is an economical way to reduce indoor air pollution which directly correlates to better respiratory health. The Five Seasons FS1625 replacement perfect fit filter design means more air is passing through the filter to effectively capture unwanted atmospheric pollution. 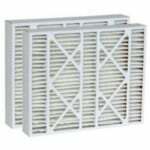 The Five Seasons M0-1056 replacement features new filtration technology which yields high initial efficiency and longer service life to protect against dust, pet dander, mustiness, mold and many other airborne pollutants. The Five Seasons 9183970 replacement provides relief from sinus irritation that causes watery eyes, itchy throat, coughing, and sneezing by capturing airborne contaminants in a high surface area filter design. The Five Seasons MU1056 replacement is a high efficiency MERV 11 filter effective in the capture of atmospheric and household dust, pollen, smoke, mold and more. The Five Seasons FS2025 replacement is a perfect fit high-efficiency MERV11 filter designed to prevent airborne pollutants from circulating through heating and cooling systems. The Five Seasons MU2025 replacement provides a low cost and high value solution for reducing pollutants found inside of homes that can adversely affect respiratory health. The Five Seasons 9183940 replacement extends the life of furnaces and air conditioning systems by providing a larger surface area that provides high flow rates. The Five Seasons FS1620 replacement filter media is rated in the effective capture of atmospheric pollutants known to cause allergic and respiratory problems.